MIDDLE BRONZE AGE, 1900-1725 B.C. 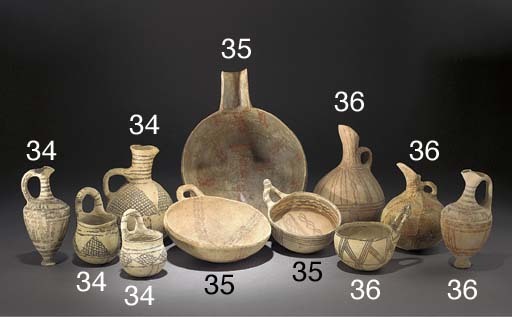 The Art of Ancient Cyprus, p. 30, pl. 22 (items one and two), p. 51, pl. 49 (items three to five), p. 31, pl. 24d (item seven) and p. 71, pl. 121a (item eight). The first two items are rare examples of an unusual ware, their decoration crudely painted and thought to be a precursor to Red-on-Black Painted Ware. Desmond Morris makes the suggestion that they should be classified as Proto-Red-on-Black.